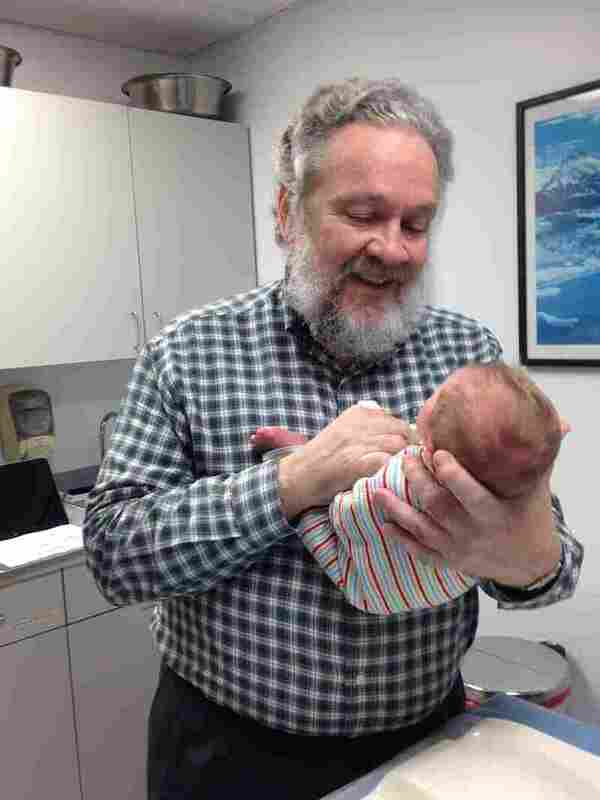 An Alaska-Sized Price Difference For Circumcisions : Shots - Health News When some pediatricians found out how much a hospital in Anchorage, Alaska, was billing for circumcisions, they decided to perform the routine procedure in their offices instead. Dr. Charles Ryan checks on a patient. It's not just patients who are stunned to see what a hospital charges for services. Two groups of pediatricians are taking a stand in Anchorage, Alaska, after learning that Alaska Regional Hospital is charging $2,110 for a circumcision — almost 10 times more than the $235 that Providence Hospital, the city's other major health facility, charges. Those prices are on top of a doctor's bill. "We were, I think, shocked by the price we were hearing," says Dr. Charles Ryan, one of the physicians at Anchorage Pediatric Group. He and his partners no longer perform circumcisions at the 250-bed Alaska Regional. Another pediatric practice, LaTouche Pediatrics, also has stopped most of its circumcisions there. Ryan now performs the procedure in his office for $700, the same as he charged in the hospital. He says Alaska Regional is a good hospital but its price for circumcisions is "wildly abnormal." The hospital provides a small tray of sterilized and reusable instruments for the doctor and a nurse to help take care of the baby during the short procedure. Kjerstin Lastufka, a spokeswoman for Alaska Regional, says in an email that the cost is based in part on the hospital's need to be ready to treat medical emergencies. She also points out that insurance companies generally negotiate better rates with the hospital, so $340 is the average amount that the hospital collects. Ryan says the doctors in his group had no difficulty deciding to move the circumcisions to their offices. "There was no long discussion," he says, noting that it took the doctors about two minutes to come to agreement. "Health care dollars are limited, and we like to see them spent in ways that really provide good health care for people and necessary health care for people," Ryan says. "And when the health care dollar is being milked off by charges ... those are dollars that can't be used for more essential things." Yet, even doctors can have difficulty finding out what hospital care costs, says Dr. Jack Percelay, a New Jersey pediatrician who also chairs the American Academy of Pediatrics committee on hospital care. Doctors are speaking up when they think a hospital is charging too much, he says, although most talk to hospital administrators behind closed doors. "Oh, I'm sure there are many private discussions in terms of setting what seems to be reasonable fees," Percelay adds. "I have not heard of people boycotting services at one hospital based on charges previously." Ryan says the incident has convinced him he needs to at least try to be better informed on hospital prices for all kinds of procedures. "Neither hospital is out there trying to put that information right in front of us," he says. "And sometimes it's hard information to get if you ask." This story is part of a collaboration with NPR, Alaska Public Radio Network and Kaiser Health News.